「Qoolife Mall」- 【GSK】SENSODYNE BUNDLE PACK (3 x 160g) - 54% OFF! 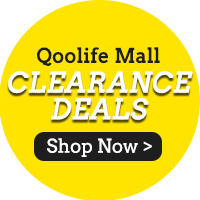 Scan the QR code or click the button below to download the Qoolife Mall app. [GSK]【GSK】SENSODYNE BUNDLE PACK (3 x 160g) - 54% OFF! Free shipping over S$50.00 purchase. If QX quick delivery passed desired shipping date/time, when customer isn't around, we will not be able to send a reshipping request on our end. QXquick orders that does not fit the shipping requirement, it will be changed to QXpress standard courier services automatically. If items ordered are out of stock, qxpress will not be able to deliver the items, shipping will be changed to a later date of delivery, at the same timeslot. For all order info changes, customers would need to cancel and reorder, because we are unable to make any changes on our end. 3) If customer did not select the free gift - request to add in, we are unable to do so as well. Please understand that all orders are automatically received, packed, and delivered. Therefore if you have made a wrong order or would like add on another item, please cancel your order and reorder. Refunds will be initiated automatically when orders are cancelled. You may cancel your order via: [My Qoo10] > [Cancel/Refund]. All Parcels will be delivered to the letterbox directly via Singpost. In the case of large parcel which may not fit into the letterbox, the postman will deliver to your doorstep. If delivery is undelivered (nobody is at home), the postman will leave a collection slip at your door for collection at the nearest post office. No tracking number is available for normal mail so please be advised that it is at your own risk. NO REFUNDS WILL BE PROVIDED thus Delivery with TRACKING is HIGHLY RECOMMENDED. Delivery usually takes 2-5 working days but minor cases delay up to 3 weeks. Thank you very much for your understanding! ALL SHIPPING information, timings or any changes/addition to the memo will require a cancellation of the order and then a re-order with the correct information. We CANNOT edit ANY information once order is placed and we cannot set the time for the delivery. For all exchanges and return before 7 days, kindly request for a return by going to MyQoo10 > Shopping list > Exchange/Return and select return. Once item is returned you will receive a full refund and you may re-order the item again or if you returned the item and want a different size of the same price range kindly message the seller once you have returned your item then give your order number and ask for the item stock level and if there is stocks we can exchange your order. AFTER 7 days please contact the seller to REQUEST for an exchange/return request. Highly Recommend Item received with thanks. Took more than 8 working days to receive the items. Items received in good condition. Expiry 2020. If you need the supplies, order early. Nicely packed in the box. Delivery is longer than expected but was not in a a hurry for it. Fast delivery and item received in good condition. Cheaper than retail and delivery was fast. highly recommended. Happy buyers. Cheaper than retails store during sales. Value for money for 3 tubes for less than 10. That is only for Swisse products! Please advise the country of manufacture as stated on the box. GSK Singapore is the distributor but these are not made in Singapore, hence please advise where are these made in? Hi customer, this is made in India! This stocks are obtained from GSK Singapore. The date of expiry is March 2020. Hello, apologies, we are only able to mail via Qxpress.